Love the idea of soaking in glorious nature under the stars … but dread the thought of sacrificing comfort? We hear you. Check out our Top 10 Most Luxurious Glamping Sites in the world! An increasing number of travellers are seeking outdoor camping adventures without sacrificing luxury and the need to bring cumbersome camping equipment. This is where ‘glamping’ – a combination of ‘glamour’ and ‘camping’ – comes in. The word may be new but the concept dates back hundreds of years to the days of King Henry VIII of England and the Ottoman sultans who were known to host lavish feasts and merrymaking with thousands of tents set up. In this article, we go around the world to come out with a selection of the world’s most luxurious glamping sites. Located on the edge of a national park and set along a 1.5-kilometre stretch of river and waterfalls, Shinta Mani Wild is the brainchild of Bill Bensley, a world-renowned resort designer. All 15 luxuriously-appointed tents on the property are perched over moving waters, providing a unique view and experience. Designed to take glamping to new heights of luxury, guests can spend the day exploring the forest with local park rangers, chill out at the bar, indulge in fine dining at the restaurant, pursue wellness at the spa or go on a luxury boat excursion. Rates start at US$8,880 for two persons (three-night stay, all-inclusive). Located in the northern part of Thailand bordering Burma and Laos, about 72km north of Chiang Rai, Four Seasons Tented Camp offers guests a unique experience playing 19th century explorer in a luxurious setting. Guests can spend time exploring the mountain trails and bamboo jungles or interact with rescued elephants. The tents are elegantly furnished with safari-style decor using local materials. Each tent has its own distinctive colour scheme with a bath in the living area and an outdoor rain shower. Rates start at US$7,292 for two persons on a two-night stay. For those who find deserts alluring, Al Maha, a Luxury Collection Desert Resort and Spa (located 45 minutes from Dubai), offers an oasis nestled among lush palm groves, emerald canopies and picturesque sand dunes of the Dubai Desert Conservation Reserve. Guests can go on horse rides, camel treks, nature walks, practice archery or learn more about falconry. All 42 suites come with a private infinity plunge pool and are luxuriously furnished with antiques and local artifacts. Rates start at around US$1,500 for two persons per night. Located on the remote Moyo island and largely untouched by mass tourism, Amanwana offers 20 luxurious safari-style tents either facing the ocean or the jungle. The remote island is home to deer, macaques and wild boar roaming freely within the island’s 32,000 hectares of protected jungle. Surrounding the island are turquoise waters and pristine reefs of the Flores Sea. Within 10 minutes from the resort are the best scuba diving and snorkelling spots. On land, there are interesting hiking trails that lead to cascading waterfalls, bat caves and other surprising finds. To get there, guests have to take a one-hour flight from Bali to Sumbawa, make their way to the nearby port and take a 45-minute boat ride to Amanwana. Rates start at US$800 for two persons per night (inclusive of meals). Ritz-Carlton takes guests on a Bedouin experience in the Al Wadi desert while still comfortably surrounded by luxury. The 2,723 sq ft tented villas are not only huge, but also come with a private pool, opulent bathroom with soaking tub and open desert views. At the equestrian centre within the property, guests can take horse riding lessons or go for pony and camel rides. Archery, biking, star-gazing, bird-watching and nature drives are some of the other outdoor activities. Guests can also unwind at the spa with hydrothermal facilities and private treatment pavilions. Rates start at around US$950 for two persons per night at the premium tented pool villa. EcoCamp Patagonia is an award-winning sustainable hotel located in the heart of Torres del Paine National Park in Chile. 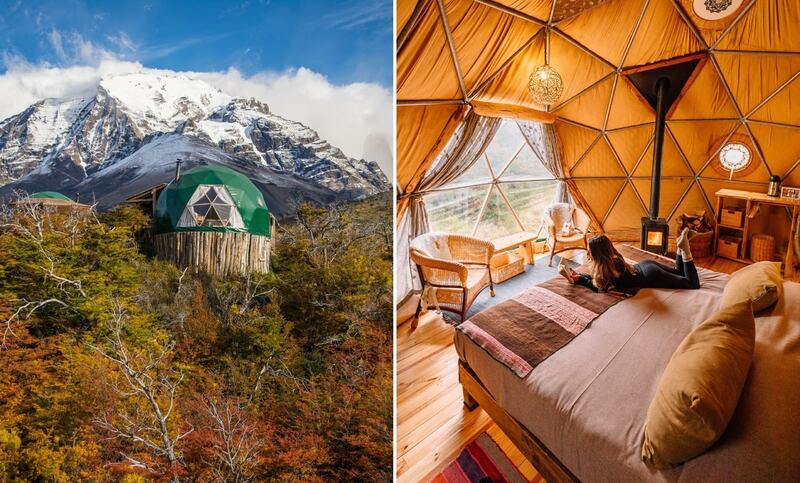 It is said to be the world’s first geodesic dome hotel set against snow-peaked mountains. EcoCamp not only provides a comfortable oasis in the park where visitors can connect with nature while enjoying modern amenities and delicious meals, but also offers exciting and diverse activities such as horse riding, trekking, nature walks, boat rides, kayaking and more. Rates start at US$400 for two persons per night. If glamping with elephants is your thing, try Elephant Hills, hailed as Thailand’s first floating campsite set against a backdrop of towering limestone cliffs. Located within Khao Sok National Park in southern Thailand, the campsite offers 30 safari-style tastefully-appointed tents. Guests can go on forest walks, trekking excursions, canoe trips and, of course, interact with the elephants. The site even has a swimming pool. Rates start at US$565 per person per night. 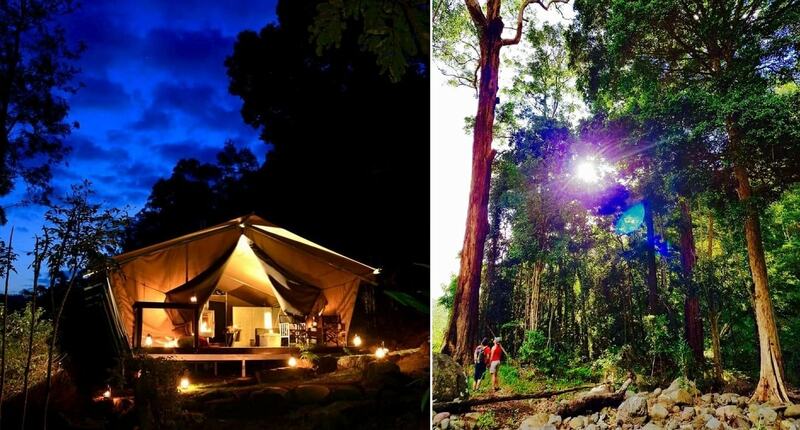 Located near Lamington National Park at the Gold Coast region in Queensland, Australia, Nightfall Camp offers luxury tents that can accommodate only eight guests (or four couples) at any one time, to ensure peace and privacy. The solar-powered luxury tents are fitted with timber floors, private bathrooms with twin bathtubs and rotating fireplaces, and are situated beside the crystal-clear tumbling headwaters of Christmas Creek and Queensland’s rainforests. Guests can relax with a massage alongside the river rapids, dine on fully organic camp cuisine and enjoy complimentary sparkling wine and espresso coffee. Rates start at US$566 per person per night. Located at the edge of Chitwan National Park in Nepal, Tiger Tops Elephant Camp is a private-owned property that offers guests an intimate stay with a herd of 11 elephants. Unlike other establishments, Elephant Camp promotes responsible animal activities like walking with elephants in the jungle and studying their behaviours. The animals are left alone to roam and socialise freely. Within the camp are six safari tents with attached bathrooms. Fun activities you can enjoy within the national park include bird watching as well as jeep and river safaris. Best time to visit the camp is between March and April or October and November when the weather is comfortable and the landscape green. Rates start at US$160 per person a night. From mysterious deserts, lush tropical forests and panoramic grasslands to elephant camps, riverside retreats and parks with mountain views, there is a wide choice of glamping experiences to suit all tastes and budgets.